Holocaust Memorial Day commemorations in York are extended to also mark the massacre – in 1190 – of the City’s own Jewish population at Clifford’s Tower. This year, this will be held from 6.30-7.30pm on Thursday 14th March at Clifford’s Tower itself in the presence of the Lord Mayor and the civic party. It will include music, spoken accounts and the recitation of the Kaddish. All are welcome and no booking is required. In January, Holocaust Memorial Day itself was marked a week long programme of events, including in York Minster with the 600 Candles commemoration and featured readings, prayers, musical reflections and personal accounts of those who have been affected by the Holocaust and recent genocide. 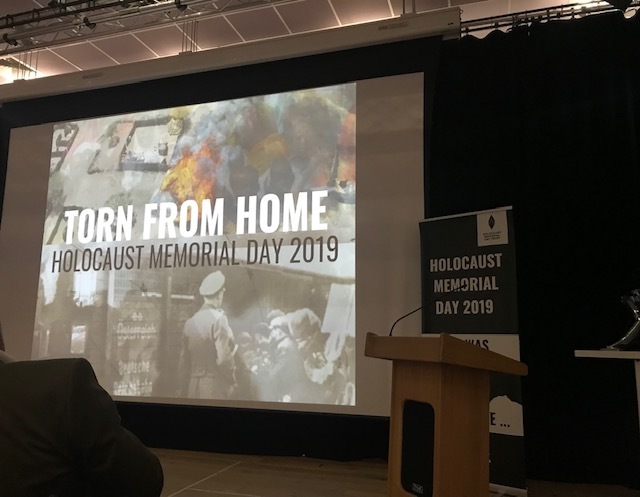 The theme of the civic event this year was ‘Torn From Home’ and featured a reading by Lee of Susanne Ehrmann’s story of being separated from her family as a ten year old girl and the impact of the Holocaust on her family and herself. Jack Morris also recited Kaddish and provided and explanation of its significance, in what was a very poignant and moving memorial.